Ah, retail. It has lured in the best of us with promises of employee discounts (a sham), the "fun" of working with people (not so much), and flexible hours (don't make me laugh). What we got instead: cranky customers, sadistic managers, idiotic coworkers, and, oh yeah, the hell that is doing inventory. But there are ways to lessen the pain, and this retail handbook will show you how. Inside you'll learn how to handle the crazies (both customers and coworkers), feign product knowledge, and make the best of working the register, all the while, of course, pretending you care. This book takes years of retail experience and condenses it into a guide that is as funny as it is useful. 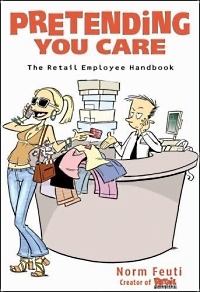 If you work in retail now, have done so in the past, or plan to do so in the future: this is the book for you. Author Norm Feuti is a Massachusetts based cartoonist with over 15 years of retail management experience. He has sold everything from men's footwear, fine jewelry, toys, arts and crafts supplies to giftware, clothing and countless other items. His comic strip Retail, on which the book is based, is syndicated by King Features and appears in newspapers nationwide. Reader Adam Richter from New York says,"... This book is an absolutely realistic take on the retail experience which will educate new employees and amuse seasoned veterans. Instead of the familiar corporate propaganda about how to kiss up to customers, author Norm Feuti focuses on the flip side: namely, despite your best efforts at working hard and being nice to customers, you will often get nothing but abuse in return. The difficulty and unpredictability of dealing with the public is the book's main recurring theme, and for anyone thinking of a career in retail, it really can't be emphasized enough: you WILL have to serve a lot of hostile, shifty, or just plain crazy people on a daily basis..."
Reader Marla Warren from Illinois says," This book is a gift for all the brave souls who work in retail! Anyone with any retail experience with laugh out loud with recognition at the scenarios Norman Feuti describes. I do like working in retail but this book captures the downsides in a hilarious way. It also allowed me to discover Feuti's comic strip 'Retail' which I think of as 'Dilbert' for retail employees. Webmaster's note: I've never worked in retail, but I found this book loaded with truisms about people and society, and we all have to deal with people and society. This book is funny, but true, and easy to read, and sprinkled throughout the book are cartoons from the author's syndicated comic strip, "Retail", which makes it even more fun to read. Click here for more information.